WE ARE ONE OF THE LARGEST MANUFACTURER EXPORTER OF LAB GROWN DIAMONDS IN ROUND BRILLIANT CUT , PEAR SHAPE , MARQUISE SHAPE, EMERALD SHAPE , OVAL SHAPE LAB GROWN DIAMONDS AT CHEAPEST PRICE OFFER IN THE WORLD, THAT'S OUR 100% GUARANTEE TO YOU. Lab created diamonds, also known as engineered or cultured diamonds, are grown in highly controlled laboratory environments using advanced technological processes that duplicate the conditions under which diamonds naturally develop when they form in the mantle, beneath the Earth’s crust. These man-made diamonds consist of actual carbon atoms arranged in the characteristic diamond crystal structure. Since they are made of the same material as natural diamonds, they exhibit the same optical and chemical properties. Our lab diamonds are grown from the tiny carbon seeds of pre-existing diamonds. Advanced technology – either extreme pressure and heat or a special deposition process – mimics the natural method of diamond formation. Lab grown fancy colored diamonds are formed when small amounts of specific trace elements are present during the growth phase of the diamond, just like in nature. In both white and fancy colored lab diamonds, the exact composition of trace elements may differ from their natural diamond counterparts. 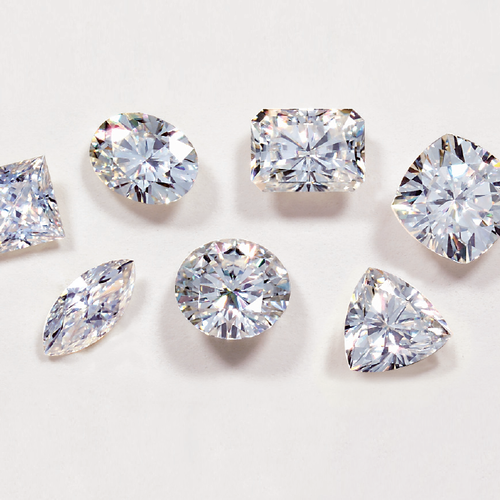 Our lab grown diamonds are now readily available in a variety of colorless ranges. Cultured diamonds are also available in fancy colors that are considered very rare in nature, including popular hues of vivid fancy yellow. Fancy colored lab created diamonds sell at comparatively reasonable prices compared to their natural colored diamond counterparts. Our lab created diamonds display the same physical, chemical, and optical characteristics as natural diamonds, and exhibit the same fire, scintillation, and sparkle. Using a jewelry loupe, man-made diamonds are nearly impossible to differentiate from natural diamonds. Lab diamonds may exhibit different trace elements than natural diamonds that do not affect the appearance of the diamond. Lab diamonds can be distinguished from natural diamonds only with tests using specialized equipment. Lab created diamonds available for purchase should always come with a gem certification identifying them as laboratory-grown. We “HRB Exports” have gained success in the market by manufacturing, exporting, importing, wholesaling and retailing a remarkable gamut of Moissanite Stone, Diamond Beads, Diamond Earring, Silver Bracelets, Diamond Necklace, etc. We are a well-known and reliable company that is incorporated in the year 1999 at Surat (Gujarat, India). Our offered products are manufactured in compliance with the pre-defined industry norms and tested to ensure their flawlessness. We export our products to USA, UK and Canada. In addition, we also import our products from China and Russia. We are a Sole Proprietorship firm that is managed under the supervision of “Mr. Hitesh Bambharoliya" (Director & Owner), and have gained huge clientele.